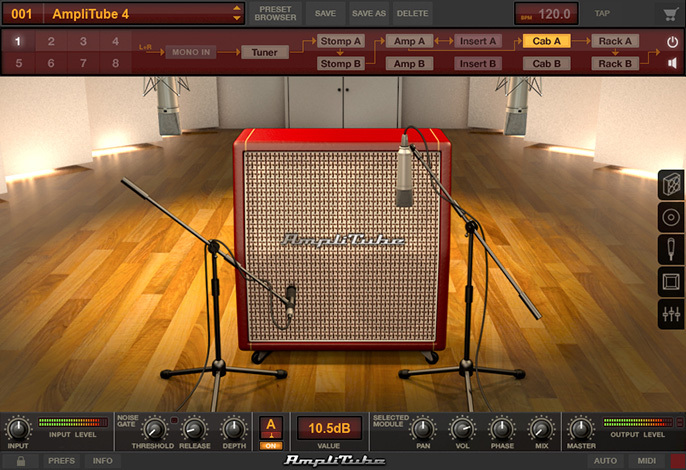 If you haven’t looked into the cool world of guitar amplifier modelling softwares like AmpliTube and others, you’re in for a treat — and if you have, then you already know just how much fun it can. These are software plug-ins and they’re generally called “amp and effects simulators” or more correctly “amp modelling” programs and you can use some of them as a standalone application on your PC and Mac or they’ll run inside your favourite DAW like Protools and Cubase while you’re recording that Grammy-winning hit. But let’s forget the home studio for the moment. Here we’ll look at amp software running as a standalone program — something you can do yourself without needing any DAW skills — and what I reckon are the five best front-runners on the market today. But first, a quick explanation. The developers of these programs go to a great deal of trouble to sample and then “model” the original hardware amplifiers and effects pedals so the results are very close to a genuine reproduction. The gear is meticulously recorded and processed in professional studios before being integrated into the software. Which means that not only are you hearing authentic sounds when you use these programs, also the various controls, knobs and adjustments are accurately modelled, too. You can learn a lot about choosing and setting up an amplifier, stomp boxes and your effects signal chain before you ever buy the real thing. I don’t consider the following five programs any worse or better than each other, but some do have a different approach to offer. More important, they’re all very high quality. Amplitube is one of the first amp modelling programs I encountered and way back in its early versions it was already a jaw-dropping plug-in. 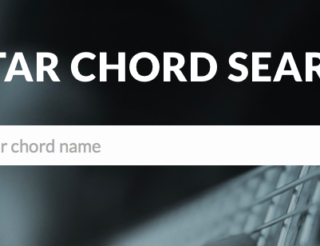 You could instantly dial up Jimi Hendrix’s strat, Hank Marvin’s mellow Shadows sound or shred your computer speakers with some modern heavy metal. Now it’s up to Amplitube 4 and like a lot of designers IKM offers you several different bundles based around a core product. With Amplitube 4 you still get a large range of different amplifiers and stomp boxes to mix and match, however, if you’re looking for something more then IKM’s Custom Shop allows you to buy extra amplifiers and pedals. What’s interesting is that IKM now licenses the use of famous equipment, so you know exactly what you’re buying, whereas back in the ol’ days it could only hint at the gear being simulated with presets named like “Jimi in the Wind” and “Get The Edge”. The really good news is that a completely free version of Amplitube 4 called the “Amplitube Custom Shop” can be downloaded and it already has a small selection of amps and pedals to try — no catch, no hidden costs. 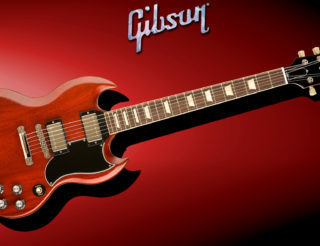 The idea is that you purchase and build your collection of virtual guitar gear one piece at a time. That’s brilliant. 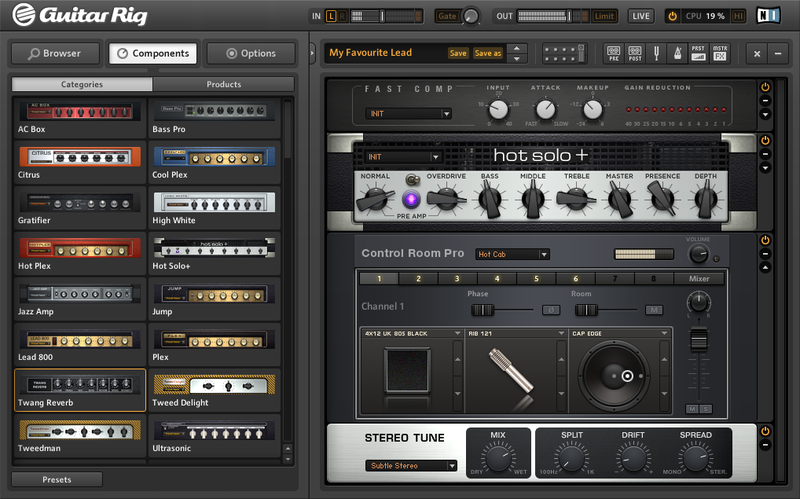 The name “Native Instruments” is synonymous with high quality and Guitar Rig 5 is no exception. GR5 gives you a huge selection of amplifiers, effects and signal modifiers all in a virtual rack configuration. Even some of the most recognisable stomp pedals have been rendered into rack devices such as the lime green “Skreamer” module, which is a reproduction of Ibanez’s legendary Tube Screamer pedal. And the “Distortion” module that mimics the Orange coloured, time-honoured Boss Distortion stomp box. So NI flirts with copyright danger and leaves little doubt as to what original equipment the virtual devices are modelled on. The rack design makes it easy to rearrange your signal chain with a drag-and-drop action — which can make a significant difference to your sound. Also, because NI has lots of other virtual instrument, synthesiser and keyboards products and the effects for these are shared across the range of VST’s, you’ll get plenty of wild and whacky signal processors in GR5 that create some awesome synth-like sounds from your guitar. So if you’re looking for presets that are “out there” GR5 is the way to go. 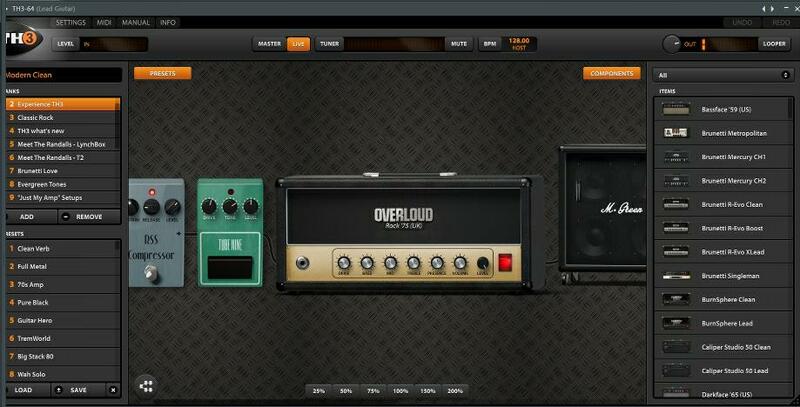 There is a free version of GR5 called the “Guitar Rig 5 Player“, which has a very limited selection of modules. After that, you have to upgrade to a GR5 Bundle. You can’t buy individual modules. Don’t be fooled by the simple name, “TH3”. It’s a guitar amplifier modelling program that has an enormous range of amplifiers, effects, cabinets, microphones… the list goes on. Overloud is another developer that’s licensed the use of famous hardware — in this case the boutique brands of guitar amps Randall, DVmark and Brunetti, which are sort of the musical equivalent of expensive sports cars with a super-model waiting for you in the passenger seat. To be fair, new users might find TH3 a little overwhelming at first with the sheer amount of choice on offer. Plus it provides both stomp pedal and rack-mount modules that can be inserted into multiple signal chains… yes, things can get pretty crazy. If you’re already getting a headache just thinking about that, TH3 has over 1000 presets included to work your way through before trying to build any virtual rigs of your own. TH3, as well as Amplitube and GR5, has dedicated settings for selecting different virtual microphones to “place” in front of your cabinet and where to put them — such as off-centre, in the middle of the speaker driver and the distance away. I’ve waited until now to mention this, because TH3 takes this concept further than most (although Amplitube 4 comes close) with a complete 3D environment for microphone placement including a choice of different rooms. That’s getting kind of beyond what we’re looking at here, but later in your guitar playing career it’s a cool tweak that you’ll appreciate. There’s no freebie version of TH3 unfortunately, just a time-limited demo. You have to hand it to Peavey with its latest version 4 of the ReValver software. Revalver been around a long time and quickly got left behind by the likes of Amplitube and Guitar Rig, but Peavey got busy and rebuilt Revalver “from the ground up” as they say — and the results are impressive. Not surprisingly many of the virtual amplifier and cabinet models are based on existing and vintage Peavey amps which many old school guitarists will tell you have a distinctive sound you’ll either love or hate. But the wide range of settings in Revalver 4 makes that no longer an issue (if it ever was a problem). Like Native Instruments, Peavey has opted to mimic the third-party effects like virtual stomp pedals and make it very obvious what that original gear must have been. That Ibanez Tube Screamer mentioned earlier appears in Revalver 4 as the “Greener” stomp box (in case you’re wondering, it is an iconic effects pedal and any guitarist who owns an original guards it like the crown jewels). A lot of focus in ReValver 4 is given to cabinet choices, microphone selection and placement. You won’t find a free version of ReValver, but the top Producer pack is significantly cheaper than some of its competitors and you can still buy extra modules. Line 6 is a company which specialises in guitar effects, particularly hardware foot pedals and signal processors. Way back in 1998 Line 6’s original Pod processor was revolutionary in the high quality of sounds it produced without a heavy, loud guitar amp in sight. 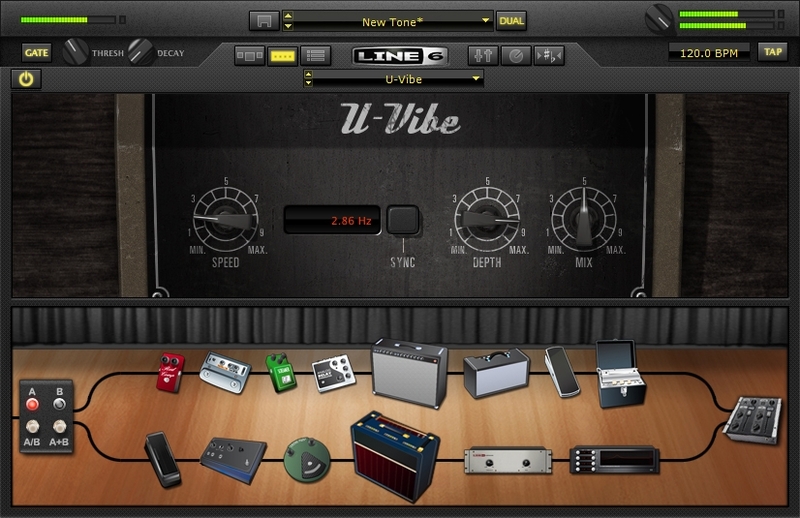 Line 6 progressed over the years to make virtual amp modelling software like Pod Farm available to its customers, but until recently you still needed Line 6 hardware to use it. Now Pod Farm 2.5 offers hardware independence — you can use it with any USB audio interface. It goes without saying that Line 6’s long pedigree of amplifier modelling means the virtual sounds, effects and configurations are all top class. You can try Pod Farm 2.5 Free for yourself by downloading it directly and playing with a limited number of amps and effects. If you’re impressed, the next step is an upgrade to the real thing. All the above standalone plug-ins require that you have a reasonable computer (some cheap laptops might struggle) and some kind of audio interface. 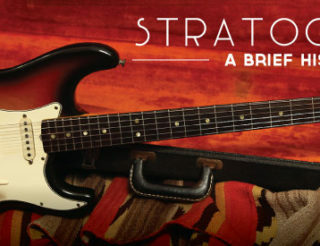 There are quite a few inexpensive audio interfaces designed specifically for guitar. We’ll look at these in another blog. Just be aware that trying to use your computer’s in-built sound card will result in latency issues that will drive you crazy. Now, go and crank up some virtual amplifiers and make some noise. 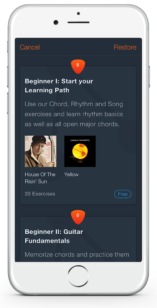 Oh, and just to remind you, with our latest version of Uberchorp App, you can use any of the above mentioned guitar amplifier modelling softwares while you improve your guitar playing skills. By January 28, 2013 – 8:56 amExcellent column. I was checking constantly this blog and I am impressed! Tremendously of use information exlentiopalcy the last part I be bothered representing such in order much. I was looking for this certain in a row for a prolonged calculate. Express gratitude you and best of luck.